There were three great letters in the Wichita Eagle recently. The first describes how renewable energy is growing and may soon meet much of our energy needs; the second describes the advantage of using a Carbon Fee and Dividend system to reduce pollution; and the third describes how cities may use electric vehicles in their transit system to cut air pollution. The letters are printed below with the authors’ permission. I read with interest the column by Ed Cross about energy and the need for American energy independence. I’m afraid I need some help defining his “extreme environmental activist.” Is it a person who favors any type of energy besides fossil fuels? Is it a person who wishes to return the United States to using coal entirely to produce our electric power? I would guess that Cross did not enjoy the latest statistics from the alternative energy sector: In the first three months of 2017 the entire United States derived 10 percent of its electric power from solar and wind energy. If you look at the mathematical curve describing the growth of solar and wind power in the past 10 years, it is exponential. Naysayers regarding green energy have said for years it is a mere Boy Scout experiment, it will never produce significant power. The power that was produced last year by green energy sources in the United States exceeds the total electric power consumed by the entire nation in the year 1950. The United States at that time was a highly developed industrial nation that was producing vast quantities of steel, and other high-value, energy-intensive products. There is no question that if we stay on course with where we have begun, green energy sources will clearly surpass fossil fuels for every purpose within the next few years. If Cross is so interested in American energy independence I am puzzled as to how he can be opposed to American green energy. By definition green energy must be produced here in our country and nowhere else. The op-ed (June 25) by Edward Cross calls for energy policy discussions without the divisiveness of the past. I agree. As a volunteer with non-partisan Citizens’ Climate Lobby, we bring Republicans and Democrats together to talk about energy and climate solutions. We have identified a market-based solution called Carbon Fee and Dividend that grows the economy, levels the field for foreign trade, and puts more money in the pockets of consumers. Four of the six largest oil companies signaled their support for this type of plan just last week. I appreciated Mr. Cross reporting an improvement we can take comfort in, that from 2005 to 2016, 60 percent of carbon reductions in electric power production were due to fuel switching from coal to natural gas. 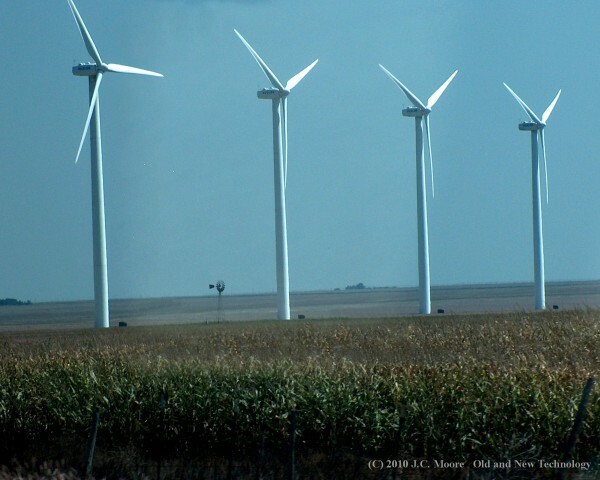 Kansas wind helped reduce CO2 as well. Switching from coal to gas cuts emissions about 50 percent, but wind or solar cuts it to zero. Americans want a common-sense energy policy like Carbon Fee and Dividend that sparks innovation that appeals to liberals and conservatives. No yelling needed, just respectful discussions. It is hard to believe that Wichita has a smog problem, but it does. Wichita’s Department of Public Works should be commended for its work in reducing ozone emissions, but more needs done. Wichita could further reduce emissions by buying electric vehicles when its buses and vans need replacing. Park City, Utah, replaced its diesel buses and found that, though they cost more to purchase, they saved money over time. They reported an equivalent 21 mpg compared with 4 mpg for a standard diesel bus. Large power plants produce about twice as much work for a given amount of fuel as an internal combustion engine. That means that using electric vehicles cuts fuel use and emissions by about 50 percent. By using electric vehicles, Wichita could save money on fuel and maintenance, cut ozone emissions within the city, and reduce carbon emissions overall by about 75 percent. That sounds like a good investment. Note : This letter was shortened for printing so a bit more explanation is needed. Because of the efficiencies involved, using electrical vehicles cuts the emissions by about 50%, even if charged from a coal-fired power plant. Since Wichita uses Westar Energy which gets 51% of its electricity from non carbon sources, the emissions are cut in half again, giving an overall reduction of 75%. And, the emissions are at the power plant rather than within Wichita. The authors are members of the Citizens’ Climate Education and the Citizens’ Climate Lobby groups in Wichita. They are both strong advocates for a carbon fee and dividend system to ensure clean air, pure water, and a healthy future for our children. Westar Energy is proposing a rate increase for customers who install solar panels or other distributive energy sources. Those Net Energy Metering (NEM) customers would have to choose between an additional $50 a month energy charge, or a $15 fixed fee plus a per-kilowatt rate demand charge based on the previous month’s maximum usage. If approved, Westar’s rate proposal will increase the payback time for installing solar panels from 12 years to more than 20 years, greatly discouraging solar installations. As a Westar stockholder, I am opposed to additional fees or higher charges on Net Energy Metering customers. The NEM customers should be seen as a resource rather than a liability and should be encouraged. They should be treated just as any other customer when they draw energy from the grid, and just as any other supplier for the net energy they produce. Does it really matter if Westar buys energy from NEM customers or from the Southwest power pool? Westar’s website says it will “support public policies and initiatives to accelerate the development and use of environmentally beneficial and cost effective strategies for energy efficiency programs for both customers and Westar’s own operations, zero – or low – emissions generation technologies, and renewable energy resources.” That is a good policy, but this proposal is inconsistent with it. One of the biggest future costs to Westar would be to build additional power plants, so Westar encourages energy conservation. If I cut my electricity usage by 50% by installing more insulation and storm windows, I am applauded for following Westar’s conservation guidelines. If I cut my electricity usage by 50% by installing solar panels, I would be charged a higher electric rate. That is irrational, as NEM customers would help reduce the need for new power plants just as energy conservation does. Westar should not be concerned about losing revenue from solar customers. Residential customers pay a customer fee, an electricity fee, a fuel charge, a distribution fee, an environmental fee, an energy efficiency charge, and even Westar’s property taxes. Last June, our bill was $24.95 for electricity, but our total bill came out to be $53.27 after the fees were added. NEM customers will pay less for energy charges, but will still pay the other fees. If Westar makes it too expensive, then potential NEM customers may install extra battery capacity such as a Powerwall, and withdraw from the grid entirely. Distributive generation should be seen as a resource. Westar has been proactive in developing wind and solar energy and now gets 51% of its energy from noncarbon sources. In the future, Westar will need to replace some of its coal power plants and may need to reduce its use of natural gas to cut its greenhouse gas emissions. Distributed generation would help replace the energy they produce without requiring capital investment from Westar. Coal-fired power plants release mercury, chromium, lead, cadmium, arsenic, sulfur oxides, nitrogen oxides, carbon dioxide, particulates, and radioactive isotopes. Burning coal releases millions of tons of pollutants into the air and leaves several hundred million tons behind in the coal ash. Some pollutants stay in the air and others eventually find their way into the water, the food chain, and into us. The heavy metals are carcinogenic and accumulate in tissue. Even exposure below the allowed levels increases the chance of cancer over time. The sulfur oxides, nitrogen oxides, and carbon dioxide released by coal combustion harm plants, produce acid rain, and increase the greenhouse gas concentrations. Switching to renewable energy would greatly reduce these pollutants and help preserve the environment for future generations. Encouraging NEM will benefit Westar and its customers. A study by Crossborder Energy in 2014 found NEM allows utilities to avoid costs of generation and fuel, maintenance and upgrade of transmission and distribution infrastructure, transmission losses (which account for 7% of losses), capacity purchases, and compliance with renewable energy standards. The study concluded,” The cost which utilities avoid when they accept NEM power exported to their grid shows that NEM does not produce a cost to nonparticipating ratepayers; instead it creates a small net benefit on average across the residential markets.” While it does cause power companies to have to adjust their loads accordingly, NEM reduces peak loads, transmission losses, and the need for new power plants. In California, the study found NEM “delivers more than $92 million in annual benefits to non-solar customers”. Similar research studies in Vermont, New York, California, Texas, and Nevada also concluded that net metering provided a net positive benefit for utility companies and their customers. A 2015 study done in Missouri is relevant to Kansas. A cost-benefit study of net metering in Missouri arrived at the same conclusion as the other studies, “ Net metering provides a net benefit. “ Missouri has 6000 net metering customers while Westar now has approximately 300. Westar certainly should encourage more. This proposal to impose a fee or higher rates on NEM customers is the result of short-term thinking. It will harm Westar and its stakeholders in the long run. Investing in clean energy protects the environment, reduces deaths and disease from air pollution, and creates good, local jobs. Westar must develop policies to encourage the development of renewable energy investments and energy conservation. Our energy needs will best be served by a mixture of traditional and alternate energy sources, but we must be proactive in developing our renewable energy resources as quickly as possible. Opponents of the EPA are now seeking comments on regulations that need to be eliminated by the EPA. They are, of course, focusing on the regulations that save businesses money by allowing them to pollute the environment. Please submit a comment at the link above asking that no steps be taken to weaken the EPA. It is our birthright that we and future Americans have clean air, pure water, and a livable Earth. The EPA has done a great job in limiting pollution to our environment and to remove the regulations that protect us would be a grave mistake. Though many would like to see the EPA stop limiting carbon emissions, there is well-documented scientific evidence, supported by 97+ percent of climate scientists who are members of the American Geophysical Union, that carbon emissions are making undesirable changes in the Earth and its eco systems. The U.S. is second only to China in emissions but emits six times as much CO2 on a per capita basis. If the U.S. is not willing to reduce its emissions, why should other countries? If anything, the EPA should strengthen the Clean Power Plan and reduce the amount of coal burned. Coal contains small amounts of mercury, chromium, lead, cadmium, arsenic, sulfur, particulates, and radioactive isotopes. Man burns 6 billion tons of coal each year, releasing millions of tons of pollutants into the air and leaving several hundred million tons behind in the coal ash. Some pollutants eventually find their way into the water, the food chain, and into us. For comparison, mercury is 100 times as toxic as cyanide, arsenic is 20 times as toxic, and chromium(VI) is 4 times as toxic. These three are also are carcinogenic and accumulate in tissue. Even exposure below the allowed levels increases the chance of cancer over time. The sulfur and nitrogen oxides released by coal combustion harm plants and produce acid rain. Polls show that the public does not support weakening the Clean Power Plan. The EPA’s plan may lead to increased electricity costs in the short term, but will lead to lower electric rates in the future. Coal and transportation prices are certain to increase in the future while the cost of renewable energy is falling. It costs upfront to build wind turbines and solar installations but, once they are in place, they are expected to function for 30 years or longer without any need for fuel.The EPA projects the Clean Power Plan’s proposed guidelines for particulates alone could prevent up to 3,600 deaths, 1,700 heart attacks, 90,000 asthma attacks, and 300,000 missed work and school days per year. As a result, for every dollar Americans spend on the Clean Power Plan, we will gain up to $4 worth of health benefits. So in terms of future energy costs, environmental benefits, and health benefits, the EPA Clean Power Plan is good policy for our citizens. You may submit a comment up until May 15 at https://www.regulations.gov/document?D=EPA-HQ-OA-2017-0190-0042. The Wichita Eagle recently published an interesting letter from Darrel Hart, president of the Wichita chapter the Citizens Climate Lobby. He pointed out that the House energy and water development bill , as it stands, provides subsidies of $95 million for wind, $632 million for fossil fuel and $1 billion for nuclear. The letter goes on, “Clearly when it comes to winning subsidies, wind falls short. Legislators favoring carbon-based fuel spin the idea that if wind were economical, it could compete without government help. Well, what does that say about fossil fuel? It has been receiving billions in subsidies for decades. Mr. Hart certainly has a good point, as carbon fuels are not paying their true cost. Besides the $632 million subsidies to fossil fuels, we are also providing an even greater subsidy by allowing them to release their waste products into the air without paying the external costs, i.e., the costs indirectly borne by society. The external costs for fossil fuels include health and environmental damage from particulates, nitrogen oxides, sulfur oxides, chromium, mercury, arsenic, and carbon emissions. An EU funded research study, Externalities of Energys , found that including external costs would increase the cost of producing electricity from fossil fuels by 30% for natural gas to 90% for coal, if costs to the environment and to human health were included. The carbon fee and dividend system Mr. Hart is recommending would put a fee on carbon at the source, which would require the fossil fuels to include their external costs.This would allow renewable energy sources to compete with fossil fuels on an even basis, and would greatly favor a switch to renewable energy. The leaders of the Republican Party in 26 states plan to sue the EPA to stop the Clean Power Plan. Those same leaders often justify what they want to do by claiming it is what the people want. But in this case, they are doing more what the fossil fuel companies want. 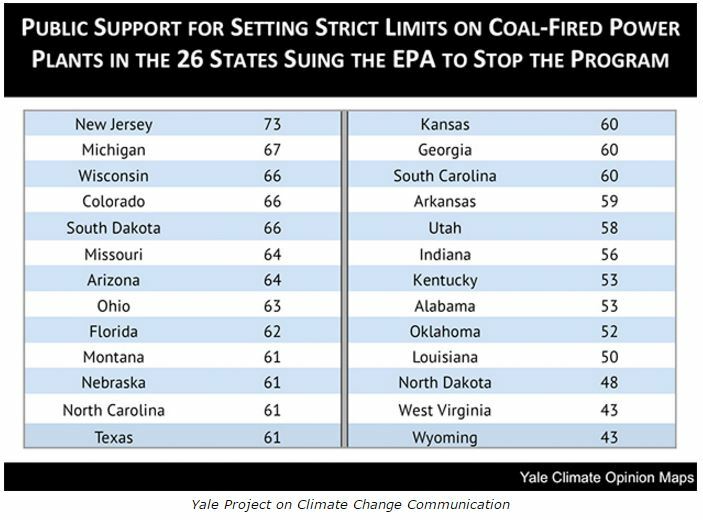 The public in 23 of the states does not support the lawsuits, as in the chart below. The governors and attorney generals of the states want to make a name for themselves as “conservatives”, but it is a losing proposition for a number of reasons. The lawsuits do not actually represent a conservative position, as the EPA’s plan will lead to a shift to renewable energy which will keep billions of tons of carbon dioxide out of the atmosphere. In that respect, the EPA has the more conservative position. The reason often given for the lawsuits is saving money on energy, but the politicians seem more interested in campaign money than saving money for their citizens. The EPA’s plan may lead to increased electricity costs in the present, but will lead to lower electric rates in the future. Coal and transportation prices are certain to increase in the future while the cost of renewable energy is falling. It costs upfront to build wind turbines and solar installations but, once they are in place, they are expected to function for 30 years or longer without any need for fuel. It will cost the states lots of money for the lawsuits, and their chances successes is slim. And, it will likely harm a number of citizens of the states if the lawsuit succeeds. There are many coal burning power plants in the US which operate without scrubbers to remove particulates, because coal is cheap and scrubbers are expensive. The EPA projects the Clean Power Plan’s proposed guidelines for particulates alone could prevent up to 3,600 deaths, 1,700 heart attacks, 90,000 asthma attacks, and 300,000 missed work and school days per year. As a result, for every dollar Americans spend on the Clean Power Plan, we will gain up to $4 worth of health benefits. So in terms of future energy costs, environmental benefits, and health benefits the EPA Clean Power Plan is a winner for the citizens. Perhaps the Republican Attorney Generals clamoring to sue the EPA should reconsider.